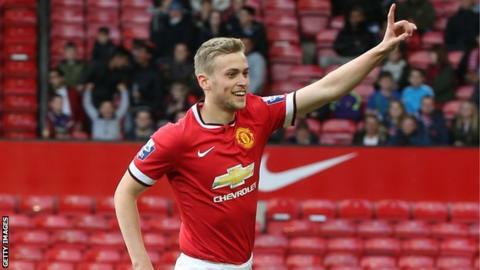 Cardiff City have declared their interest in taking Manchester United striker James Wilson on loan. United are ready to allow the England Under-21 forward, 19, to go on loan to a Championship club, although with an instant release clause. Bolton Wanderers and Derby County are other potential suitors. "It would be wrong if nobody turned their heads if there was an availability for James Wilson," Cardiff manager Russell Slade said. "He's a player of strong ability. He's somebody Manchester United think an awful lot about." Wilson has scored four goals in 18 first-team appearances, including two on his debut against Hull City in May 2014. He is yet to feature for United this season, but he scored the winner for England Under-21 against the United States Under-23 on 3 September. The Bluebirds look to continue their unbeaten Championship start on Saturday at home to Huddersfield Town. Gabon defender Bruno Ecuele Manga is among a number of players who Slade can consider for the game after international duty. Romanian defender Gabriel Tamas, signed before the transfer window closed, will be in a 20-man squad. But another new signing, French striker Idriss Saadi, will not be considered because he is not fully fit after injury. Huddersfield have yet to win a league game this season, but Slade knows they will end that run at some point. "That's why they are a dangerous team to be playing," Slade said. "They've not scored many [goals], they have not conceded many. I think it will be a tight game. "It's one we feel we want to be winning but we know it'll be tough."